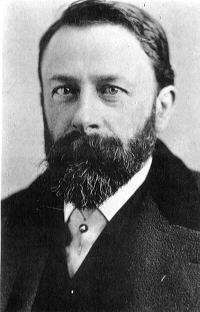 Albert Bierstadt (January 7, 1830 – February 18, 1902) was a German-born American painter best known for his lavish, sweeping landscapes of the American West. To paint the scenes, Bierstadt joined several journeys of the Westward Expansion. Though not the first artist to record these sites, Bierstadt was the foremost painter of these scenes for the remainder of the 19th century. Born in Germany, Bierstadt was brought to the United States at the age of one by his parents. He later returned to study painting for several years in Düsseldorf. He became part of the Hudson River School in New York, an informal group of like-minded painters who started painting along this scenic river. Their style was based on carefully detailed paintings with romantic, almost glowing lighting, sometimes called luminism. An important interpreter of the western landscape, Bierstadt, along with Thomas Moran, is also grouped with the Rocky Mountain School. Bierstadt was born in Solingen, Germany, the son of Christina M. (Tillmans) and Henry Bierstadt, a cooper. The following year, in 1831, his family moved to New Bedford, Massachusetts. At an early age Bierstadt developed a taste for art and made clever crayon sketches in his youth. 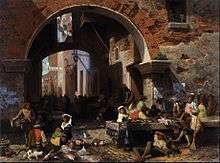 In 1851, he began to paint in oils. Map of Bierstadt's journey in 1859 and 1863. 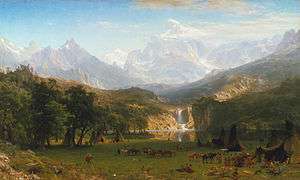 In 1858 he exhibited a large painting of a Swiss landscape at the National Academy of Design, which gained him positive critical reception and honorary membership in the Academy. At this time Bierstadt began painting scenes in New England and upstate New York, including in the Hudson River valley. A group of artists known as the Hudson River School portrayed its majestic landscapes and craggy areas, as well as the light affected by the changing waters. Rocky Mountain Landscape, in the White House. 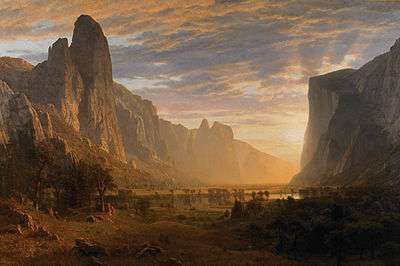 Among the Sierra Nevada Mountains, California (1868), Smithsonian American Art Museum, Washington, DC. In 1859, Bierstadt traveled westward in the company of Frederick W. Lander, a land surveyor for the U.S. government, to see those landscapes. He returned to a studio he had taken at the Tenth Street Studio Building in New York with sketches that would result in numerous finished paintings. 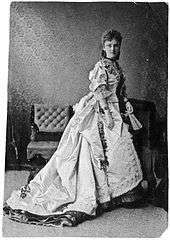 In 1863 he traveled west again, this time in the company of the author Fitz Hugh Ludlow, whose wife he would later marry. Throughout the 1860s, Bierstadt used studies from this trip as the source for large-scale paintings for exhibition. He continued to visit the American West throughout his career. As a result of the publicity generated by his Yosemite paintings, Bierstadt's presence was requested by every explorer considering a westward expedition, and he was commissioned by the Atchison, Topeka, and Santa Fe Railroad to visit the Grand Canyon for further subject matter. Bierstadt's technical proficiency, earned through his study of European landscape, was crucial to his success as a painter of the American West. It accounted for his popularity in disseminating views of the Rockies to those who had not seen them. The immense canvases he produced after his trips with Lander and Ludlow established him as the preeminent painter of the western American landscape. 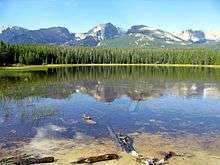 Financial recognition confirmed his status: The Rocky Mountains, Lander's Peak, completed in 1863, was purchased for $25,000 in 1865. Valley of the Yosemite also appears in a scene in Terry Gilliam's 1995 film Twelve Monkeys, accompanied by several doctors singing "Blueberry Hill". ↑ "Picturing America's Natural Cathedrals". Tfaoi.com. Retrieved 2012-05-20. 1 2 Wilson, James Grant; Fiske, John, eds. (1900). 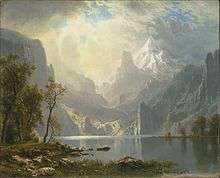 "Bierstadt, Albert". Appletons' Cyclopædia of American Biography. New York: D. Appleton. 1 2 Harvey, Eleanor Jones (2012). 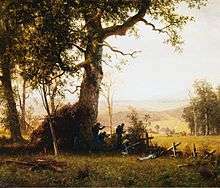 The Civil War and American Art. Smithsonian American Art Museum; Metropolitan Museum of Art. Yale University Press. ISBN 978-0-300-18733-5. ↑ Reynolds, Francis J., ed. (1921). 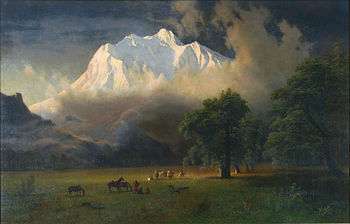 "Bierstadt, Albert". Collier's New Encyclopedia. New York: P.F. Collier & Son Company. ↑ "Albert Bierstadt: The Rocky Mountains, Lander's Peak (07.123) - Heilbrunn Timeline of Art History - The Metropolitan Museum of Art". metmuseum.org. 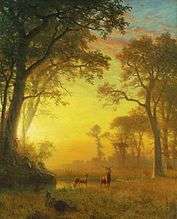 ↑ "Albert Bierstadt Images". Images.google.com. Retrieved 2012-05-20. ↑ "Among the Sierra Nevada, California by Albert Bierstadt / American Art". si.edu. ↑ Chisholm, Hugh, ed. (1911). 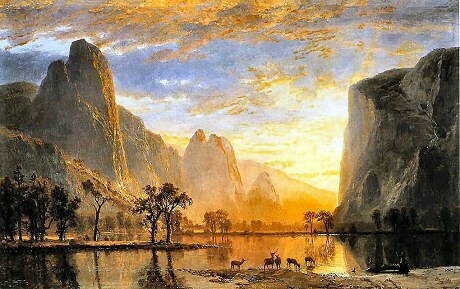 "Bierstadt, Albert". Encyclopædia Britannica. 3 (11th ed.). Cambridge University Press. ↑ Glenda Moore (2004-09-09). "xmission.com". xmission.com. Retrieved 2012-12-19. ↑ "Albert Bierstadt: The Wolf River, Kansas (61.28) — The Detroit Institute of Arts". Dia.org. Retrieved 2013-07-05. ↑ "Echo Lake, Franconia Mountains, New Hampshire / North American / Art of the Americas / Highlights By Category / Collection Highlights / Collections / Smith College Museum of Art - Smith College Museum of Art". Scma.smith.edu. Retrieved 2013-07-05. ↑ "Home / Smith College Museum of Art - Smith College Museum of Art". Smith.edu. Retrieved 2013-07-05. ↑ "Cho-looke, the Yosemite Fall, 1864". Timken Museum of Art. Archived from the original on February 21, 2009. ↑ "Valley of the Yosemite". Retrieved 31 May 2014. ↑ "In the Sierras". Harvard Art Museums. Retrieved 2013-07-05. ↑ "Among the Sierra Nevada, California". Smithsonian American Art Museum. Retrieved 31 May 2014. ↑ "St. Johnsbury Athenaeum>>This Week from the Gallery Archives". Stjathenaeum.org. Retrieved 2013-07-05. ↑ "Mount Corcoran | Corcoran". Collection.corcoran.org. Retrieved 2013-07-05. ↑ "The Last of the Buffalo | Corcoran". Collection.corcoran.org. Retrieved 2013-07-05. ↑ "Alaskan Coast Range". Smithsonian American Art Museum. Retrieved 31 May 2014. ↑ "Valley Fine Art". Valley Fine Art Gallery. Retrieved 2 March 2015. ↑ William Newton Byers, Bierstadt's Visit to Colorado: Sketching for the famous painting Storm in the Rocky Mountains, Magazine of Western History, Vol. XI, No. 3, Jan. 1890; page 237. ↑ "ArtOnStamps.org". ArtOnStamps.org. 2010-07-09. Retrieved 2012-05-20. ↑ "The Postal Store @ USPS.com". Shop.usps.com. 2011-03-28. Retrieved 2012-05-20. ↑ "image of Valley of the Yosemite". Retrieved 2012-12-19. ↑ "Twelve Monkeys (1995)". IMDb.